There are more reasons to head to town this holiday season, as efforts to rejuvenate the Orchard shopping belt ramp up with outdoor festivities. Two Christmas markets with countdown events are making their debut, in an attempt to bring more buzz to the street during one of its busiest times of the year. Invade, the organisers behind Artbox Singapore, will be transforming the 50,000 sq ft Grange Road open-air carpark into a creative market by day and neon-lit party space by night from Dec 9 to 30, it told The Sunday Times. The use of parcels of state land along Orchard Road, such as open-air carparks, for ad hoc events was among plans announced earlier this year to remake the shopping street, which has lost some of its draw amid the growth of e-commerce and suburban malls. For the first time, a European-inspired Christmas village will be set up at Ngee Ann City's Civic Plaza, featuring outdoor shopping, dining and nightly performances, the Orchard Road Business Association announced last month. More than 25 brands will set up shop during the month-long event, which starts on Nov 25. There will also be a two-storey carousel and a countdown concert on Christmas Eve. Flashbang, the Grange Road event, will feature some 120 retailers and food and beverage operators, as well as workshops, neon light installations and live music by buskers and DJs, said Invade founder Kent Teo. The event, which aims to draw a million visitors over 22 days, is supported by the Singapore Tourism Board's Kickstart Fund, which backs innovative lifestyle concepts and events with strong tourism potential and scalability. "We call it a creative retail playground... it is in the shopping district of Orchard, so we want to show how retail can evolve," said Mr Teo, 32. Having learnt from the experience of organising Artbox earlier this year, Invade has designed Flashbang to have more "breathing spaces", and scaffolding will be built to create two floors of retail space, said Mr Teo. Security personnel will also be hired to handle bag checks and for crowd control. The Artbox flea market in April attracted about 600,000 visitors over six days at the Bayfront Event Space, and drew complaints of overcrowding. To put together Flashbang in just under two months, Invade tapped its tenants at Mox, a co-making space at Katong Point launched last month. Neon Project, for example, will be supplying the neon light installations, while Snupped, which manufactures customised products, will be creating official merchandise for the event. Snupped co-founder Darcy Li said: "We can work directly with the designers in the same building... The collaborative environment is really helpful." A second Mox space is scheduled to open in Orchard Road next March, Mr Teo said. Singapore Polytechnic marketing and retail lecturer Lucas Tok said that urban markets can help to create hype and festivity in Orchard Road during the Christmas shopping season. "It is a great start to drive shopping in town once again... Retailers should take this opportunity to see how they can make use of such events to help themselves. "Otherwise, once the festive period is over, everything will be status quo" said Mr Tok. 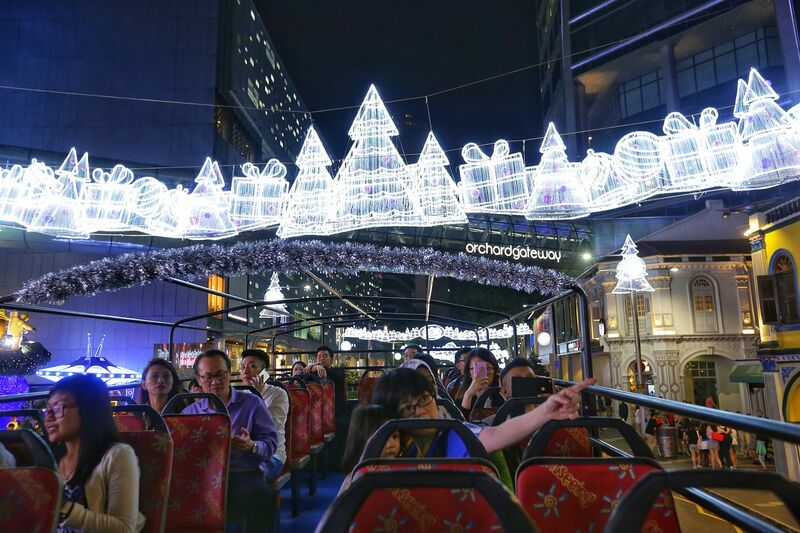 Orchard Road got into the Christmas mood last night, when 2.88km of lights were turned on to mark the start of the season of giving. The light-up, themed Endless Wonder with its hues of purple, blue and silver, runs from Tanglin Mall to Plaza Singapura. Many got to ride on open-top Hippo buses provided by the organisers, Orchard Road Business Association and the Community Chest. The lights will come on at 3pm from today and will stay on until midnight, except for Fridays and Saturdays, when they will continue to twinkle until 2am.